White Water Rafting at Black Mountains Activity Centre RaftingWhite water rafting in Wales on a natural river, is a ideal way to experience the excitement of moving white water; an absolute must for those who enjoy getting wet and love white-knuckle rides. Our experienced raft guides will guide you down river, preparing you to skill fully tackle some of Wales’ most demanding natural white water sections, and during the course of your White Water Rafting trip you will cover up to 15 miles, encountering several grade 2-4 rapids including the infamous “Hell Hole”! 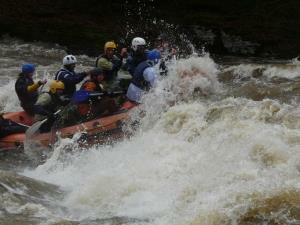 An ideal adventure for corporate team building events, stag & hen parties and adventure breaks in Wales. Be prepared, there is a high probability that you will get totally wet!